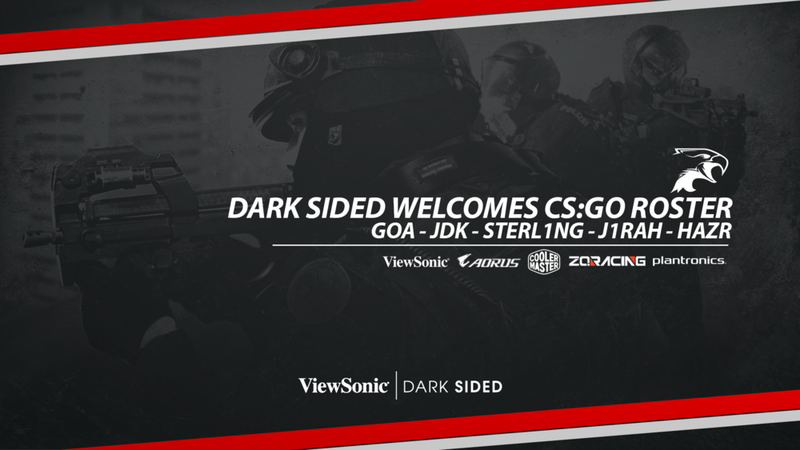 Today it comes with great sadness that we at ViewSonic.Dark Sided announce the official departure of previously signed players, HaZR, Sterling, J1rah, JDK, and goa from the organisation. Debuting their first online performance under the organisation at CGPL Spring 2017 in September, it was a welcomed sentiment to be able to support young talent once more as well as continue our presence within the Counter-Strike competitive scene. A fond moment in history with the roster stands to be AEM Season 2 LAN Finals in which the boys we’re able to attain a 3rd place finish; falling just short of the Grand Finals in a heated playoff series against Sin Gaming.  Just wanted to say a big thanks to Dark Sided for taking us under their wing 6 months ago definitely one of the best orgs in AU, they've been very supportive throughout. Unfortunately the team didn't work out in the end, but I'm wishing the boys all the best in future. ViewSonic.Dark Sided would also like to thank the boys for their involvement within the organisation as well as congratulate them on their attained achievements. The boys have spoken out and have collectively stated the roster will disband and look for further opportunities elsewhere as individuals in the new year. First and foremost we’d like to congratulate the team on a 3rd place finish in Perth at the WPGI League Season 3 LAN Finals. The girls played their hearts out against Control Esports but were not the victors on the day, losing in a close overtime situation on the Mirage. Unfortunately, now that the 3rd season of the WPGI League has concluded, the girls have decided to disband the current roster. This decision came about with Linhdt, Jsmai and Thaoiiees looking to take a short break from competitive Counter Strike. With this we sadly say goodbye to Bunny and Dashie who’ve chosen to look into other opportunities to continue playing Counter Strike during the WPGI off-season. I couldn’t be more proud of how the girls this season, they faced quite a few trials this season in one form or another and to their credit, they persevered and managed to take out 3rd place at the tournament. It was great to be able to watch them do their thing and see how they interacted with the wider female CS community on the day. With that said, I’d like to thank the players each individually for their efforts this season. 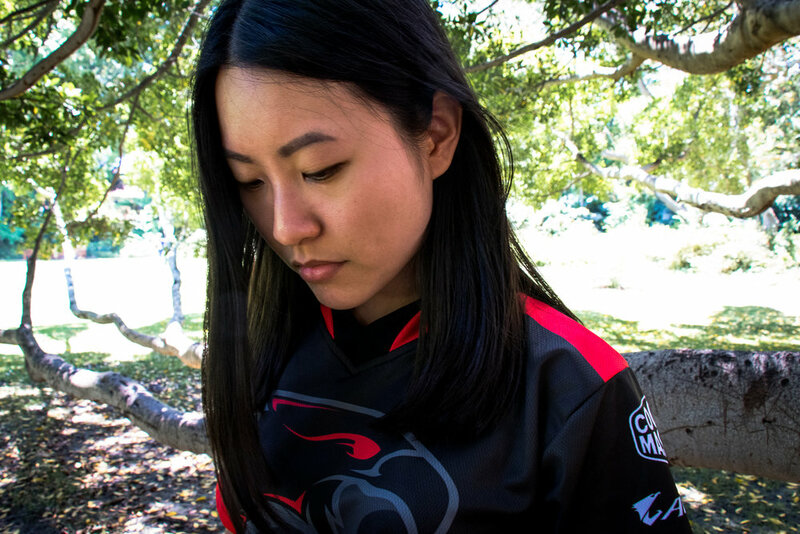 Linhdt, I think that it's amazing that you've become quite the prominent figure both internally at Dark Sided through supporting other players and externally in the community for being a fierce competitor. Thanks again for all your hard work this year. It goes without saying that it's great having you a part of Dark Sided and I look forward to seeing you play again after your break. Dashie, thanks for coming into the roster and helping out the org. We were put in a really tough spot and you really saved us while. Hopefully you enjoyed your time with Dark Sided, I know you were a bit skeptical about joining an org so hopefully we weren't too bad. It would be great to work with you again in the future so hopefully our paths cross again sooner rather than later. Jsmai, Thank you for all the hard work you've put in this year during both WPGI seasons you competed in. You always go above and beyond when it comes to representing Dark Sided and we really can't thank you enough. Enjoy your overseas travels on your break! Bunny, it was a pleasure working with you during your time at Dark Sided. You were presented with some really tough choices during the season and I was really impressed when you showed great maturity and professionalism in the way you went about making those choices. I wish you good luck and all the best with the rest of your Counter Strike career. Thaoiiees, Thank you very much for being a part of the team this season, I heard that you were not so keen on playing in the league and that you committed a lot of your own time just to help out the team. Personally I think this is a super admirable and I hope that it wasn't too bad in the end. Good luck with your streaming adventures! ViewSonic.Dark Sided would like to thank the WPGI and GroundZero teams for their tireless work to put on the event and think that after some growing pains that the WPGI League has been a really positive influence on the Australian CSGO community. We’re extremely proud to say that we supported a great team that participated in two seasons of the WPGI League in 2017 and hope to continue doing so in 2018. Since July ViewSonic.Dark Sided has been absent for the professional Australian Counter Strike scene but today marks our return to the scene with a new look roster! The roster will be debuting tonight in the CyberGamer Pro League at 9pm AEST. Please tune in and get behind the boys where they will be taking on Chiefs Esports Club. Stay tuned to the ViewSonic.Dark Sided Twitter for more Counter Strike content! Today it is with a heavy heart, that we part ways with our Counter-Strike roster. 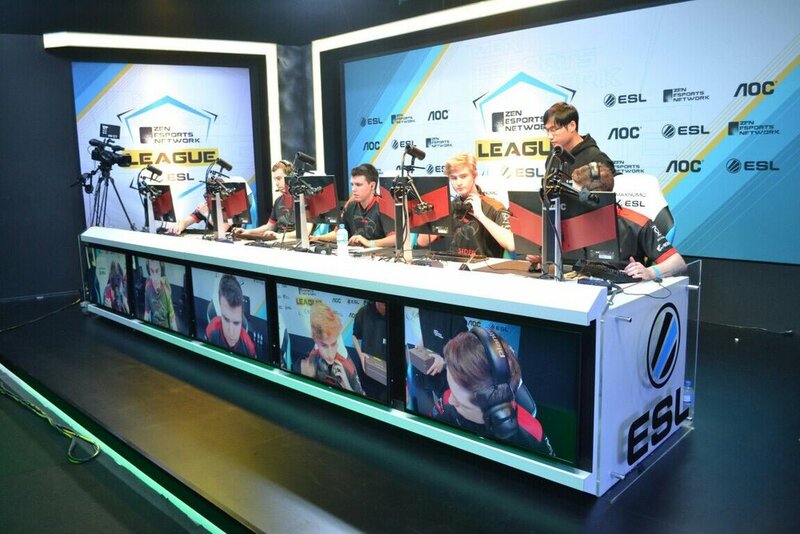 Under Dark Sided, the boys went from being ZEN League Qualifier underdogs to ESEA League Season 24 Australian champions in such a short period of time. Needless to say their achievements have not only captured the hearts of the ANZ Counter-Strike community but also garnered a lot of attention internationally as well. 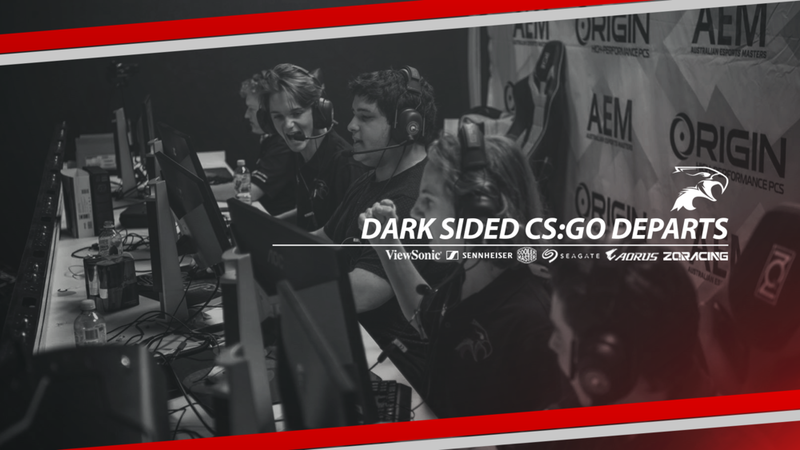 Dark Sided would like to thank the boys for everything they've achieved under the organisation, hope they continue to push themselves to new heights and find what they're looking for in an organisation where ever they may go.